1900 - Original Armadale Primary School was built. 1902 - The Armadale Brick Works opened, occupying the area where Dale Cottages now stand. 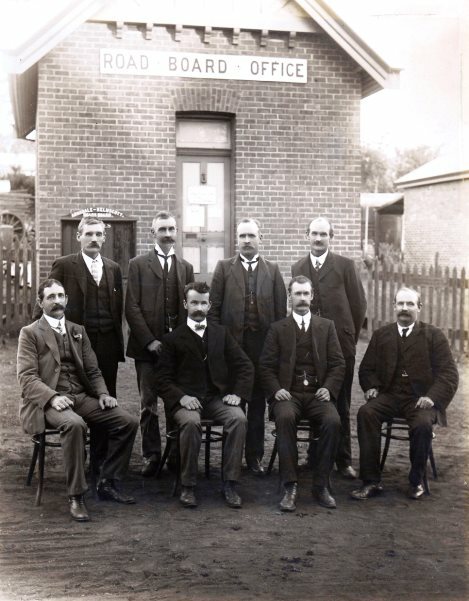 1903 - Original Roads Board Office was built. 1903 - Bedfordale area named by Kelmscott Road Board. 1904 - St Matthew's Anglican Church built in Armadale. 1905 - Roleystone School opened (it stood opposite the current-day Roleystone Theatre). First teacher J. Hickman. 1907 - Armadale to Fremantle Railway Line constructed (closed 1964). 1908 - Armadale Tennis Club established. 1909 - Gazettal of Armadale Townsite on 26 February. 1909 - Five wards created: Kelmscott, Roleystone, Armadale, Bedfordale and Beenup. 1910 - Kelmscott Roads Board renamed the Armadale-Kelmscott Roads Board. 1910 - Armadale Water Supply came online, local Water Board gazetted. 1911 - Public street lighting was introduced (initially Kerosene lights). 1913 - Turner Road Bridge built across Canning River. 1913 - St Francis Xavier church opened. 1914 - Wards increased from five to seven. Addition of Karragullen and Armadale West. 1915 - Forrestdale School opened. First teacher Miss Agnes Jeffrey. 1916 - WWI Memorial Obelisk erected in Armadale. First in Western Australia. 1920 - Soldiers' Memorial Park offically established. 1920 - Beenup township renamed 'Byford'. 1921 - Captured field gun from Hindenburg Line donated to Armadale RSL for Memorial Park. 1921 - Kelmscott WWI Memorial Obelisk unveiled. 1922 - Tennis courts opened in Armadale at Soldiers' Memorial Park. 1924 - First truck purchased by Armadale-Kelmscott Roads Board. 1924 - Power lines installed. 1925 - Official opening of the Churchman's Brook Dam. 1925 - First Roleystone Show. 1926 - First Byford Show. 1928 - Opening of the first Armadale Kelmscott Hospital. 1930 - Araluen Park was officially opened. 1940 - Official opening of the Canning Dam.